Human beings have been using pillows for the last 9,000 years. The ancient Egyptians used stones to prevent bugs from crawling into their mouths, ears, and nose at night. Japanese geisha placed their heads on stones to keep their hair in place. The Greeks and Romans caught onto the idea of comfort by using cloth stuffed with straw or feathers. Interestingly, at one point, many men considered it a sign of weakness to use a pillow at all. Nowadays, people need a lot more than a pillow to sleep, and many consumers rely on smart pillows, smart mattresses, home security, smart thermometers, and anti-snoring products such as SnoreRx and zQuiet. In our review of the MyPillow vs Casper pillow, we assumed you do use a pillow and are looking to make the best choice for a good nights sleep. According to Rubin Naiman, PhD., a sleep expert from Arizona, the choice of pillow is largely down to personal comfort issues and largely depends on your sleeping position. Those sleeping on their back often opt for thin pillows to ensure their head is not raised too high, while those sleeping on their side chose a thicker pillow to fill the gap between the shoulder and ear. Finally, those who sleep on their stomach may either select a very thin pillow or place a pillow under their stomach to prevent lower back pain. In recent times, back experts have been emphasizing the importance of using the right pillow to ensure good spinal health. Many practitioners believe the right pillow can help to prevent or even contribute to the easing of back problems, and issues such as snoring and gastroesophageal reflux are also impacted by your choice of pillow. Today’s choice of pillows caters to a wide variety of personal preferences as well as to expert advice. Lately, two pillows have prominently featured in the media, the Casper Pillow and MyPillow. Featuring a patented interlocking fill, MyPillow is the only pillow endorsed by the National Sleep Foundation. This interlocking fill adjusts to your changing sleeping position throughout the night, delivering optimum support for your neck and shoulders. Made from synthetic fibers, the outer material is breathable. The manufacturer claims that you will fall asleep faster and can enjoy a deeper, more restful sleep. The interlocking fill is designed for maximum durability and is said to maintain its volume for many years. Despite the strong neck and head support, MyPillow is soft to the touch. It’s available in five, color-coded sizes. The smallest (yellow) is designed for children or very petite women. The next size up (white) is suitable for most women, as well as men of small built. The medium size suits larger women, as well as most men, and is coded blue. The second largest pillow is suitable for large men (red), while the largest pillow is designed for side-sleeping large men who require a lot of support between the shoulders and the ear. When selecting a size, you should opt for a larger size if you mostly sleep on your side. This pillow is widely available and retails at around $100 for two pillows, or $50 for one at select retailers. 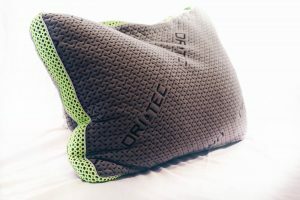 The manufacturer claims to have designed a “pillow in a pillow” concept, geared toward providing comfort as well as lasting neck and head support. The inner pillow is firmer and delivers lasting support, while the outer pillow is soft and comfortable. Filled with nearly one billion fibers, the inner pillow adjusts to your position and continually supports the neck and head, regardless of your movements. The longer fibers in the outer pillow combine into a soft pillow with a conventional feel but without any clumping. This outer pillow bounces back immediately whenever you move. A unique gusset holds the two pillows together and strengthens the structure for lasting support, especially for the neck. 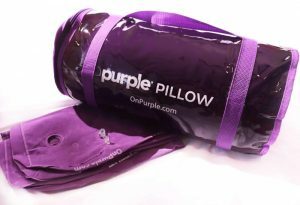 Thanks to a breathable 100% cotton cover and the silky internal fibers, this pillow is designed to stay cool throughout the night. The design of the Casper Pillow stems from in-depth research into sleeping positions and patterns. The softness, as well as the lasting support, are believed to greatly enhance the quality of your sleep. The Casper pillow is only available from the Casper website and retails at approximately $75. Both pillows provide enhanced neck and head support by using technology. The Casper pillow’s outer layer is perhaps a little softer, however, MyPillow is available in various sizes to provide extra comfort. Though many may prefer natural down feather pillows or opt for lower-priced support pillows, both undoubtedly deliver stronger support, bounce, and softness. The breathability of both also helps to keep the pillows cool, and thus improve your sleeping experience. At $75 and $100, both pillows are considerably more expensive than many other support-providing pillows. Make sure to check out some of the genuine reviews before you make your purchase. When you read the various MyPillow reviews you will find anything from high praise right down to the harshest of criticism. The people at MyPillow also paid out more than a million in a lawsuit settlement. Several consumer groups had sued the company for making false claims about their product. Since then, the company had to significantly tone down its advertising and marketing language and refrain from making misleading product claims. Casper reviews are harder to find, simply because this pillow is only available for purchase on their website. Reviews are consequently largely controlled by the company even though you can still find plenty of negative reviews. The 100-day money back guarantee offers customers some comfort. At least you have the option of returning the pillow and getting a full refund if you don’t like it. The Casper pillow and MyPillow have sold thousands each, and countless people are exceedingly happy with their purchase. Ultimately, different pillows suit different people, and consequently, both pillows may or may not suit you. There are plenty of other great pillows on the market, some of them at a considerably lower cost than these two. Pillows contribute to the quality of your sleep and impact on your overall back health. Many people have experienced significant relief from back pain, neck, and shoulder stiffness, snoring, and acid reflux by using a pillow to deal with the particular personal issue. Read our reviews and do your research before deciding on which pillow to buy that will suit your individual needs.